The main workshop program starts at 1:00 pm on Tuesday, June 18. An evening reception follows. The main workshop ends on Saturday, June 22 at 1:00 pm. ​The accommodation information below applies to main workshop participants who may check in their lodging either on June 17 or June 18. ​A single, dorm-like room costs $95 a night. Single rooms are part of a suite with a shared bathroom, lounge, and kitchen.The suite accommodates up to 10 people. Rooms at this rate are available for stays of 10 days or less. To book a room, please go directly to the International House web page (active link) and fill out an application form under Housing. In the comments section, identify yourself as part of the Japan Studies Group. Pre-payment by credit card is requested approximately 5 days after your application is processed and you are notified. The cancellation fee is one night's stay, or $95. You may book your room as late as May 7. ​This is an option for participants who would like a room with a private bathroom or to share a room. JSA has reserved a block of seven rooms at the rate of $165 a night plus tax, estimated at $35. A reservation can be cancelled up to 48 hours in advance, or there will be a one-night cancellation fee. Rooms are available at the JSA workshop rate only for the nights of June 17-22. You may make your reservation to start either on June 17 or June 18. Please note: The workshop ends at 1:00 pm on Saturday, June 22. There are no rooms available on Saturday night, June 22. The International House is available any night during the workshop, under ten nights total. ​Please indicate your preference to stay at the Sheraton on the application form. The workshop organizers will send you a hotel booking code. If you'd like to share a room at the Sheraton with another JSA workshop participant, we will help you arrange that. Please state your preference in the application form. ​As the Sheraton-University City is located two blocks east of the International House (see map below), the distances to both Community College of Philadelphia and University of Pennsylvania are very similar. They are seven minutes away from Penn's Williams Hall -- a nice walking distance for Tuesday (June 18), Friday (June 21), and Saturday (June 22), when events will be held at University of Pennsylvania. Please note that on Tuesday morning and Saturday afternoon arrangements will be made to visit the Penn Archaeological Museum's world-famous Chinese collection. It is three blocks east of Williams Hall. 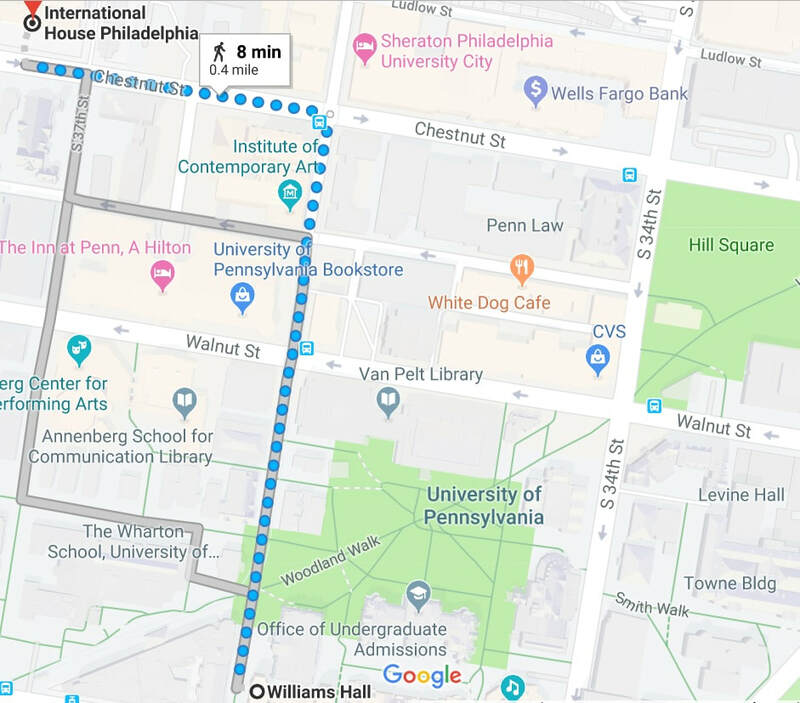 Below is a map showing the way to Penn's Williams Hall from the International House and Sheraton Philadelphia University City. It is a four-minute walk to a trolley that takes participants to 19th and Market Streets; from there, there is a ten-minute walk to the CCP campus, where we will meet on Wednesday (June 18) and Thursday (Jun 19). The Pre-Workshop sessions on June 12-13 are held at Community College of Philadelphia. On Friday, June 14, the session will be held at University of Pennsylvania. The Pre-Workshop is designed primarily for local faculty. The map below describes how to get from the workshop accommodation -- the International House and Sheraton - University City -- to Community College of Philadelphia (see the map's top right corner).